Today I am still fighting what I can only guess is a sinus infection. My whole head hurts and I am stopped up but its not bad just irritating. I am still able to do all my workouts and work, I just have a headache. This mornings workout was a special one. For starters, we are officially 2 days away from being done with the Cut workout. I have enjoyed it but every workout is done twice so I knew exactly what to expect and this is the workout that made me so sore last week. It was actually better today and I am not so sore...yet! But another reason it was so special was because my workout buddy came (even though she didn't want to today) and my running buddy came. I told them when we were working out my dreams came true. I got my workout buddy running and my running buddy doing workouts. It made me smile the entire time. The rest of the day I spent at work and now I am enjoying something that hasn't happened in a really long time. I have the night off. I have the entire night off. No ballgames, no workout, no nothing. I have used the time to spruce up my blog a little bit (hope you like it), and come up with some new things to make the blog a little more interactive. Let me tell you a little bit about it. On Tuesday we will do Tips and Tricks Tuesday. The idea is to focus on one product, exercise, or food that I use and would recommend. This started the other day at Sonic when we stopped to have drinks and my sister did a small commercial to show you what this little exercises is all about. She is going to kill me for posting this! 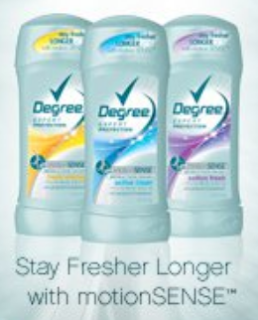 But today's product is Degree Deodorant Motion Activated. My sister told me about it after she bought it and it really is amazing. Even after a intense workout I still smell pretty good. And if there is no workout involved it smells like oranges all day long. The commercial was too much for Sister 2 and you can hear Sister 1 in the background rolling laughing. Haha. Alrighty, then we go on to Wednesday. I have a new blog hop to put into motion. I used to participate in a blog hop that was one of my favorites but she stopped hosting it so I thought I would start one up like it. On Wednesday we will hop around "Fat Friends Thinking Thin!" The basic idea is for diet, exercise, fitness bloggers to find each other. I found a lot of the blogs that I read from her hop and hopefully I can find some new ones with this. Some Wednesdays there may be a topic and some days you can just link up and find new friends. I don't have a banner for it yet but I will soon so until then we will just have to pretend that there is a pretty picture at the head of the post. I might put something together until I get a good one made. I hope you guys enjoy some of the new things to come and I hope to see you link up tomorrow. I have to be up to run in the morning so I am taking advantage of my early night and going to bed. Night all!!! Y'all are hilarious! I love sisters! That cracks me up. Oranges all day, huh. I may have to try that.